Buying bread rather than making it at home was as common for the Romans as it is today-if the evidence of Pompeii is to be believed. Much is known about recipes for ancient bread from surviving texts- but not how bread was baked on a commercial scale in towns. Pompeii helps fill this gap. It preserves many examples of commercial bakeries, complete with their own mills, ovens and labour saving devices. The sheer number of bakeries and the scale of their production shows that buying bread in the ancient roman world was as common as it is today. Many homes in Pompeii baked their own bread but it seems that bakeries or pistrina were popular food outlets in the town. In one bakery, 85 loaves were found left in an oven at the time of the eruption showing the demand for shop brought bread was high. Bakeries are easy to identify because of the large bread ovens attached to them. 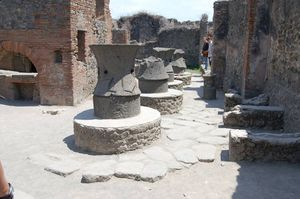 About 35 bakeries have been found in Pompeii, each supplying their local area. Larger bakeries also had their own mills. These establishments were generally found on the town’s main streets and in the northern part of the city, close to the countryside and the supplies of grain. Mill rooms were separate and equipped with as many as four millstones made of basalt lava, driven by donkeys to grind the grain. Each mill consisted of a basin or meta, with an hour glass shaped stone called a catillus on top. Grain was poured into the top of the catillus through a funnelled opening and then ground between the two stones, collecting in a tray called a lamina. Dough was prepared in a different area. Unusually, this was not always by hand. In the bakery of Popidius Priscus, an industrial scale bread making machine was discovered with the dough mixed with large paddles. Machinery was common in Roman baking. Special kneading machines existed. Dough was wound around a horizontal shaft in the bottom of a basin and then pressed between wooden slats in the basin’s sides. Only the shaping and stamping with the mark of the bakery was done by hand. Baking occurred in a further room equipped with large ovens fuelled by vine wood. Each oven had a flue to vent off the smoke. Many oven rooms also had ceiling vents to help disperse smoke. Each loaf was inserted into the oven on a wooden paddle before being left for about half an hour to cook. Finished goods were then stored before selling to the public. Many bakeries had a separate street entrance for the transportation of goods, suggesting that even if they did not sell directly to the customers themselves, they did deliver.